The Hobart PowerMaster 2400 series is the market’s best choice when it comes to 400Hz solid-state Ground Power units. The Hobart PowerMaster is small and simple, reliable and robust. The 2400 features unique output voltage, smart user interface, software update via USB and the standard overload capabilities that match all types of aircraft. 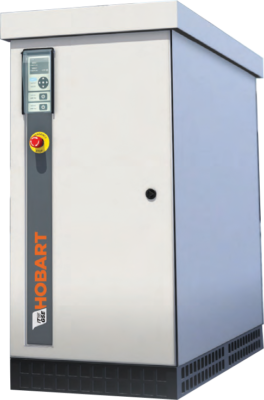 The Hobart PowerMaster 2400 is capable of delivering 400 Hz and regulated 28.5 VDC (additional option) power, simultaneously and independently. The 28.5 VDC Active Rectifier Unit (ARU) – available as an option delivers superior voltage quality at the aircraft plug without jeopardizing the 400Hz output. The Powermaster is available in 120,140,160 and 180kVA configurations with the option to be trailer or stationary mounted. It goes without saying that the Hobart PoWerMaster 2400 will power your aircraft, whether a narrow body or a turbo prop, whenever you need it!